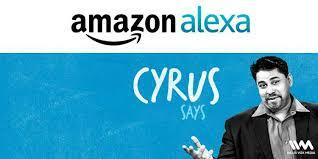 Cyrus Broacha, TV and theatre personality, comedian and host of the show said, "Wow Cyrus Says is on Amazon Alexa? Keep in mind Cyrus himself is not available. Just Cyrus Says. Ask Alexa to play me, I mean Cyrus Says."